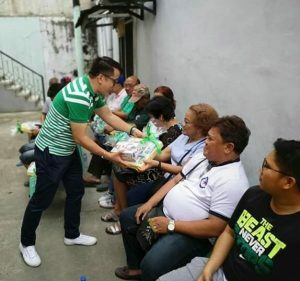 PROVISION OF MEDICAL EQUIPMENT IN PASAY – Jaime V. Ongpin Foundation, Inc.
On October 17, 2018, the barangays of Pasay City benefitted from the provision of the medical equipment (each containing a weighing scale, a digital thermometer and a BP apparatus) as one of the interventions of EMBRACE in providing access to health of individuals to underprivileged communities. A Deed of Donation was signed by Councilor Isidro and was witnessed by Ms. Jennette Angeles, barangay kagawad. This was then followed by the distribution of the 115 sets of medical equipment to the different barangay captains. “First of all, I want to thank the EMBRACE for giving us these medical equipment that we can use to help those people who needs assistance in monitoring their health. I also want to thank the barangay captains and BHWs for coming here and I hope you will use these equipment to help our people. Let’s thank EMBRACE for all of these”, said Councilor Isidro in his message. According to barangay captain Noel Mariano of barangay 134, they need these equipment to help them monitor the health condition and medical needs of the residents of their barangay. The barangays captains then thanked EMBRACE and left with beaming smiles.